Use the WebAnimator Plus software to create gifs, HTML5 animations, banners, and buttons that work perfectly with every web browser and device, without writing a single line of code. Boost your online projects with WebAnimator! Want to generate traffic and improve your online sales? Enhance your website, presentations and banners with animations and effects that capture your audience. An improved user experience draws in new users and converts them into potential clients. Sharing your knowledge is the best gift you can give to your students. That's why we've designed our products to be as attention-grabbing as possible so, you can teach your students using your full potential. WebAnimator for PC is the tool you didn't know you craved. You can use it to make fun gifs to share with your friends, or customized banners to publish on your website. Are you a developer? Access all of WebAnimator's functions and integrate the API into your projects. Catch users' attention with animated menus, icons and buttons, guide them where you want. 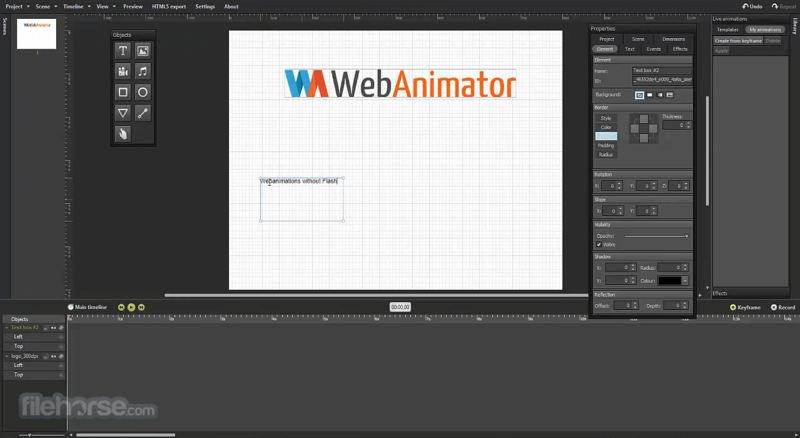 Use WebAnimator to create banners, download the HTML5 code, and add it to your website. The interface boasts a new, flat design and integrated panels instead of the former superimposed look. We added the option of inserting a video by simply entering the YouTube URL. 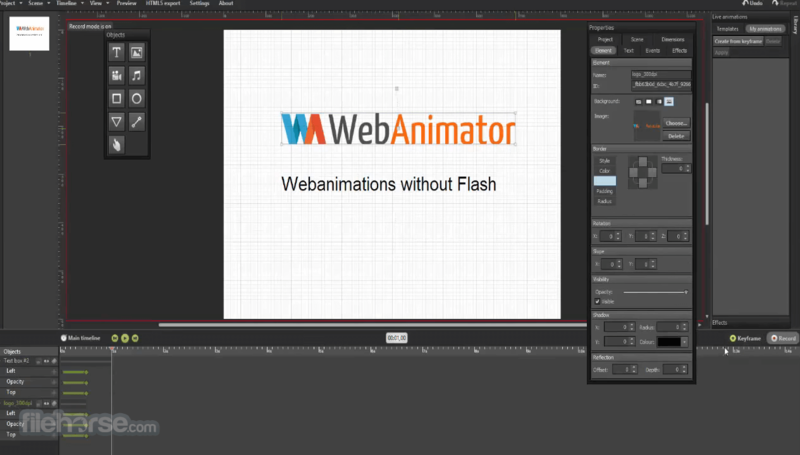 You can design your animations to be responsive, meaning they automatically adapt to the browser window's dimensions. Now you can view your chosen Google Fonts directly from the stage than only in the external browser preview. You can add objects directly with one click, no need to drag the icon from the toolbar to the stage. From the Properties menu, you can see how properties change when an effect is activated. Syntax Highlighting in the editor now lets you enter text. More than 1 million royalty-free images are available in the library for you to import directly into your projects. We added the option of importing SVG vector images. 5 new effect presets added to those already available. Replace your internal rendering engine with Chromium to increase speed and improve design functions. Now you can copy and paste key image frames as well as objects with associated key frames. 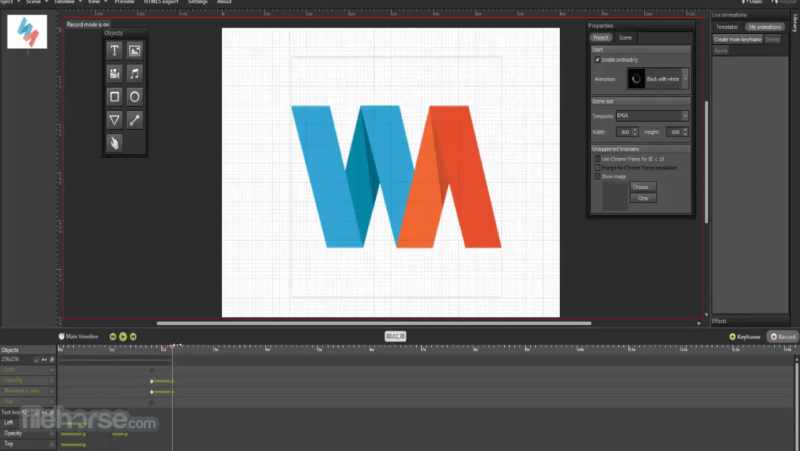 You can use more shapes than just the rectangle and the circle, choosing from a library of shape presets.